EVERMOTION is an educational and informative portal, directed to 3d community, with particular emphasis on visualization and rendering techniques. The company was founded in 1998 by Krzysztof M. Kundzicz alias PENdzel, in the Polish city of Bialystok. Our portal unites CG fans and Professionals alike and our success has made us one of the largest CG resource sites in the world. Currently we have over 220,000 unique visitors every month, who generate 1,600,00 page views. 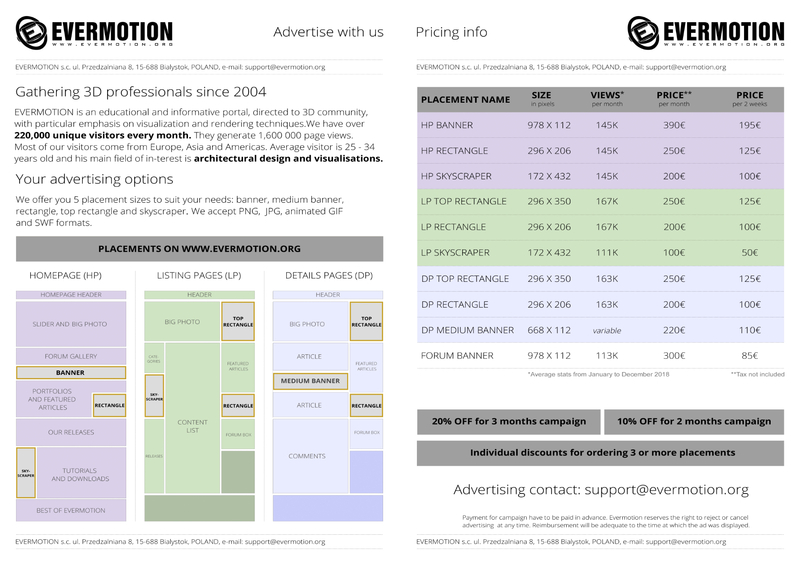 If you want to advertise on www.evermotion.org, please send email to support@evermotion.org with "Advertising" in the topic.